As I write this in early February, tomorrow is Super Bowl Sunday (Go, Saints! 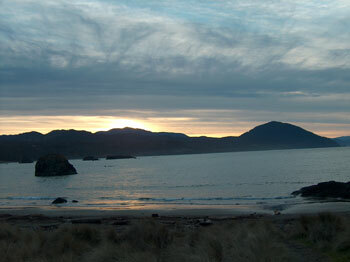 ), and our section of the Oregon coast is gray and damp, although surprisingly windless today, at least temporarily. 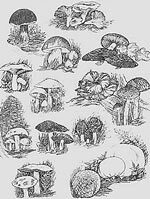 My mind is wandering to spring time, and what it may hold for us in the way of mushrooms. The fall, 2009 season wasn't a good one for us, in terms of quantity. As Mary has written, we found new mushrooms that were interesting and fun to encounter, but some of our old friends were conspicuous by their absence. Sure, we found enough Golden Chanterelles for the table, but not enough to preserve much for future years. Boletes weren't abundant, and neither were Matsutakes, at least in our favorite haunts. What will Spring hold for us? Much depends on the timing and amount of our travels. If I was to schedule an ideal year, when we had ample time and the Mushroom Gods cooperated, it would look something like this. Verpa are a sure sign of spring! 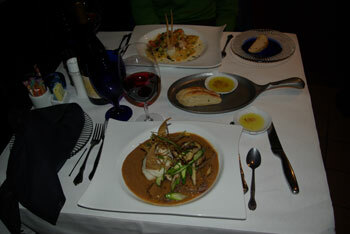 A recent trip to Salem suggested a return visit to the Old Europe Inn, a restaurant that had impressed us on a visit several years ago. It's a small but lovely restaurant, warm and welcoming. We didn't recall a specific dish from our earlier visit, but did recall that the food was very good, and the presentations were exceptionally attractive. They didn't disappoint on the second visit, either. Spectacular is the first word that comes to mind when we try to describe our winning recipe this year. Not only is Merry Graham's entry spectacularly delicious and innovative, it's also spectacular visually, with a golden flaky puff pastry enclosing a plump and tasty filling of onions, mushrooms, pears, bacon and cheese. When we contacted Merry to let her know that she'd won the contest, her reply was simple: "Ahhh, you just made my day! " She spends part of almost every day concocting new recipes in her Santa Clarita, CA kitchen. Her passion for developing tasty dishes was ignited in 2009 when she discovered the world of recipe contests. "I love recipe contests that have required ingredients. It sparks my creativity!" The galette is layered with tasty ingredients! Let the winter winds blow and the rains beat against the window panes. I'm curling up on the sofa with a new mystery, The Draining Lake, by the outstanding Icelandic author, Arnaldur Indridason. When it's time for lunch, there'll be a flavorful bowl of truffle-scented soup from the pages of "Cooking Light" waiting to comfort me. Winter in Port Orford was quite mild this year. As stated elsewhere in our website (and many others! ), Taylor F. Lockwood is arguably the best mushroom photographer on the planet. His annual wall calendar is a perennial delight, and the 2010 edition graces myoffice wall, directly in my line of sight. It's stunning. Taylor's calendar finally motivated me to purchase his book, Treasures from the Kingdom of Fungi (copyright 2008). In a word, it's astonishing. Mushrooms and fungi from all over the world, some familiar, many not, all with one thing in common: they are simply gorgeous. If you like mushrooms at all (and if you don't, why are you here? ), your coffee table needs this book. So do you. See www.kingdomoffungi.com. And to give you another taste of Taylor's work, see his photographs of some of the more poisonous fungi at www.scientificamerican.com/article.cfm?id=seven-deadly-shrooms. In the growing "green" movement, developments are happening quickly. One of these seems to hold considerable promise: insulation (and packing materials) that aren't manufactured, but rather grown. Two young entrepreneurs, Eben Bayer and Gavin McIntyre, have developed a strong, low-cost biomaterial that uses fungal mycelia and agricultural cast-offs like seed husks; a cubic inch of the stuff contains eight miles of mycelium fibres. Intended to replace styrofoam and similar petro-based products, the production of their material creates no carbon, consumes little energy, and it can be composted away when disposed. They've formed a company called Ecovative Design, headquartered in Green Island, New York, to produce it, Check them out at www.ecovativedesign.com. Folks in the Pacific northwest are definitely crazy about morels, but our ardor for them doesn't even approach that held by people in the central and eastern part of our country. According to an article in the May 3, 2009 edition of the Pittsburgh Post-Gazette, early May will see one million Pennsylvanians take to the woods in search of Morels. This is about the same number as take to the woods in the fall for deer hunting, something of a religion in those parts. If anything, Morel hunting is approached with even greater secrecy, and prime spots are - like here - closely guarded secrets.